Fall is the peak season for warm-from-the-tree apples. 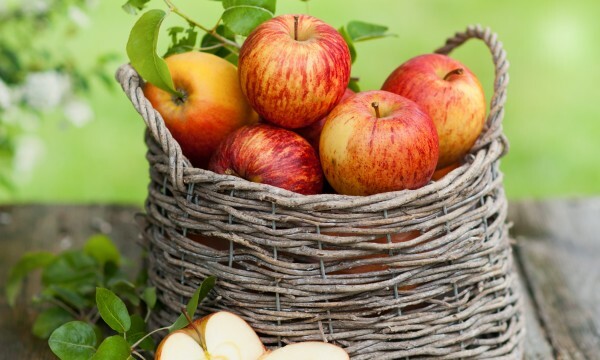 If you're still baffled by all the available varieties – the best for eating raw and which are better for baking – as you peruse the apple section in the grocery store, here's some help in choosing the right apple for all your cooking and snacking needs. The delicious Braeburn apple varies in colour from solid red to greenish-gold. It has a sweet-tart flavour that can almost be described as spicy. Because Braeburns don't collapse with heat, they can be used in baked apple pies, turnovers and apple tarts. The Cortland apple is a popular, all-purpose offspring of the McIntosh apple with a crisp texture and sweet-tart flavour. 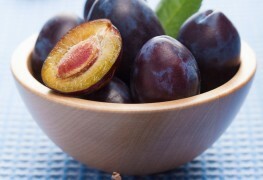 Since its flesh resists browning, Cortlands are perfectly suited for fruit salad or wine and cheese plates. 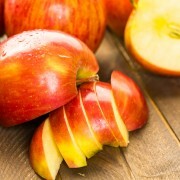 Fuji apples are sweet and aromatic, making them a delicious choice. Fuji apples can be safely stored at room temperature. 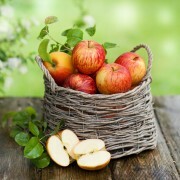 The apple's flavour becomes even sweeter after being stored for several weeks. They can be used for baking and applesauce, and even chopped up and frozen for future baked goodies. If you prefer a crunchy, semi-sweet apple with creamy, white flesh, choose a Royal Gala. Galas are a good snacking apple, will hold their shape quite well when cooked, and are a top choice among apple varieties that can be deliciously paired with soft cheeses. This pale yellow apple is sweet and juicy. When freshly picked, Golden Delicious apples are firm, but they do grow softer with age, especially if they're not properly refrigerated. These apples are a great choice for snacking and eating raw, but freshly picked ones also work well in pie or in a favourite apple crisp recipe. This popular green apple has a tart flavour and firm, crunchy texture. Many people enjoy snacking on them raw, but Granny Smiths also taste great combined with other varieties of apples in a pie, an apple crisp or even chopped up in a salad! Look no further than the Ida Red when searching for a good baking apple. It can even be used in a delicious walnut and apple stuffing! 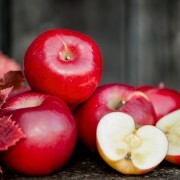 This firm, bright red apple has a tart flavour that can be nicely tamed with baking spices and sweeteners. When stored in a controlled climate, an Ida Red's flavour gets even better over time. This type of apple has a juicy tartness that works very well in homemade applesauce, which, on its own, can be used in an array of other sweet recipes. It's not a top choice for baking since it doesn't hold its shape well, but you can't beat the crisp sweet-tart flavour of a McIntosh apple freshly picked off the tree. The Red Delicious apple is probably the most popular variety you'll see at the market. Its sweet flavour and firm, juicy consistency make it an ideal snacking apple. However, this apple turns into mealy mush when it's used for baking. Although there are countless other varieties of apples out there, these nine types tend to appear most frequently in the produce aisle. Are you hungry, yet?